What’s a good place to visit at the start of the Year of the Pig? The Geotechnical Engineering Office (GEO) of the Taipei City Government’s Public Works Department suggests Taipei residents and visitors go to the Zhinan Scenic Area to soak up some new year vibes. This scenic area is easily accessible from the Zhinan Temple Station of the Maokong Gondola, which is a fun and fast way to bypass the new year’s traffic jams on the mountain roads. The architecture and the religious and cultural heritage of the Zhinan Temple, with its numerous red lanterns around the new year, make for a festive atmosphere. The temple and recreational facilities, carefully designed and well-maintained by GEO, make a wonderful destination for a new year’s hike with family and friends. Zhinan Temple manager Kao Chao-wen said that the temple is located at a serene mountain top in Wenshan District. In recent years, the temple and GEO have jointly established various new points of interest in the scenic area and improved the appearance of the surroundings. Late last year, the forest around the Qixing Pond in the mountains at the front of the temple complex was upgraded by removing some dense patches and planting rhododendrons and Formosan sweet gums to give the park a more classic Chinese feel in tune with the architecture of the temple and the little chapels spread over the grounds. GEO Forest Recreation Section Chief Sun Shu-hsia said that the agency has constructed a Chinese zodiac themed mountain trail for visitors to experience the cultural heritage left by the ancient Chinese saints and recluses. At the Pig Zodiac Sign Area near the top of the trail stands a pair of cute human-like pig statues wearing ancient ceremonial high hats that signify a welcome to special guests. 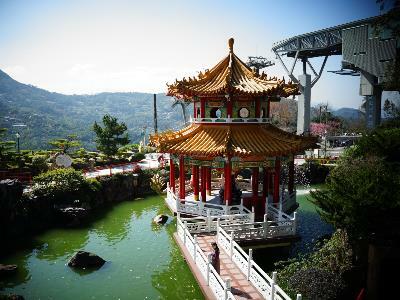 At the onset of the Year of the Pig they may grant good fortune to people that take the trouble to visit them all the way up the mountain, which is why this time of year this scenic spot proves highly popular. At the highest point of the trail sits the “Lovers’ Spot” with a romantic and breezy gazebo overlooking the Taipei cityscape, including Taipei 101 and the Maokong forest and tea plantation area. (1) Front mountain area: Take buses 530 or Brown 5, alight at Zhinan Temple Stop. (2) Back mountain: Take Community Bus 10 or Zhinan Left Line, alight at Zhinan Temple Stop. When riding the Maokong Gondola, alight at Zhinan Temple Stop.